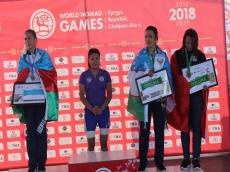 The Azerbaijani national team won two silvers and one bronze medal in the mas-wrestling competition of the Third World Nomad Games in Kyrgyzstan. Nargiz Ibrahimova (75 kg) and Rasul Safarov (60 kg) won silver medals at the mas-wrestling competition, Yakutia's national sports. Sultan Agayev (80 kg) claimed the event's bronze medal for Azerbaijan. As reported, over 2,000 athletes from 80 countries will participate in the ethnic sport games during the cultural event that runs through September 8.